Formed in 2013, World Flag Rings is a company set up to try and help people find pride in where they come from. We are deeply proud of our own national heritage in life, and it has played a major role in our development as people and professionals. 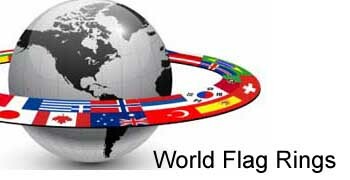 World Flag Rings is managed by a team of various nationalities, all proud of their heritage. Alongside this, we also understand and appreciate the power of multi-culturalism and bringing people together for the right reasons. Whether its receiving a knowing nod from a fellow national or hugging a stranger as you celebrate your sports team claiming a last minute winner, our world flag rings are hugely popular for those who really love to celebrate and take their love of the world further than ever before. We care deeply about the power of national pride and the ability of nationality to bond us together. What are not, though, is a company looking to build division. Instead, we want to help people make their nationality part of their identity without making it their whole identity. From making it easier to flaunt your nationality when out in public to ensuring that you can show off the perfect way to really bring two people together, our world flag rings have many uses. It’s part of why we exist; to help use the power of nationality as a conversation starter and as a symbol of unity, not division. If you would like to find it easier to show off your love of your nation in public, then let us help you do just that. With so many different flags to cover, we’ll make sure that you can easily show the world who you are and what you stand for with the absolute minimal fuss! Got any questions about how our products are made or how we deliver them? Then feel free to Contact Us today. We’ll do all we can to help you show your nationality off in a language that anyone can understand!